Our best-selling feather bed mattress topper treats you to the luxe comfort of a fine hotel. Provides gentle cushioning to your shoulders and hips for a deeply restful sleep. 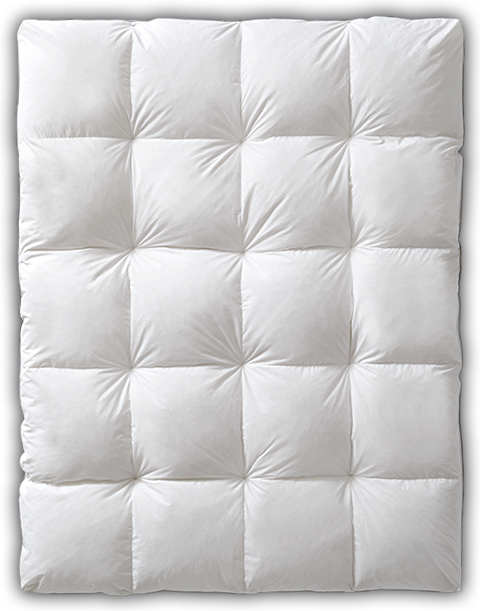 Includes our machine washable, zippered protector, an essential companion to your feather bed. The best money I have ever spent. It's so good I don't want to get out of bed in the morning. I give it an A++++++. Every night will feel like a refreshing getaway when you cuddle up on our most popular Baffle Box Feather Bed allowing the Resilia ® feather fill to cushion your pressure points as you drift off into heavenly sleep. The secret to this best-selling style is the true baffle box design with 3-D fabric boxes on the inside that keep the feathers in place and create extra room for outstanding loft. Durable, 230 thread count 100% cotton covers this cozy and supportive feather bed that is trimmed nicely with white cording. The 100% cotton protector slips easily over your feather bed where it can then be fully enclosed by the zippered bottom. When its time for care, refresh your protector in your washing machine. Baffles are internal fabric walls separating the top and bottom layers of fabric in our down comforters and feather beds. These walls form three dimensional boxes providing more space within. This clever design feature allows the fill to fluff to its very fullest for maximum comfort. Barrier Weave® specially woven to prevent feathers from sneaking out.